World-class leadership onboarding delivered smoothly, quickly, and efficiently. To view our onboarding videos and other Connect the Dots product videos, click here. You pulled out all the stops to find the right leaders for your organization. Now seal the deal with an onboarding process that will make them glad you did. You just hired a key player for your organization and want to make sure he’s/she’s here for the long haul. Effective onboarding processes increase the likelihood your new leaders will be engaged and stay with your organization longer. Most organizations have some type of onboarding process. However, many are not getting the results they expect. Onboarding is giving your leaders the foundation for success. You are investing in them, which lets them know you think they’re worth it. But few onboarding processes provide key knowledge, develop critical relationships, and deliver actionable feedback. These vital steps build a strong foundation for your leaders’ success. In addition, more businesses are looking at human resources to measure the impact of onboarding on the organization. You want to make sure your new hire is up-to-speed and productive as quickly as possible. We understand that your time is valuable. Why should you spend it creating just the right program for your new hire when we’ve already done it for you? When new leaders transition into new organizations and roles, a complex environment is created. Both the new leaders themselves, as well as the organizations, have high expectations for results. Connect The Dots Consulting guides the leader from the first stage (Offer Accepted) to the final onboarding stage of Transition. We understand the dynamics that play out when organizations recruit and hire new leaders to fill key roles. The selection process (for both internal and external leaders) is heady stuff. The leaders are courted and touted for their previous results and experience. 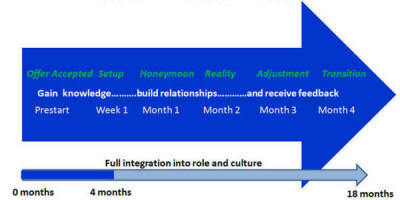 Promises are made or implied during this process, in the form of resources, support, and decision-making latitude. The leaders are often confident that the skills and behaviors that previously brought them success can now be applied to these new roles – and they will undoubtedly exceed expectations! However, our research shows that during the third month of these transitions, reality hits quickly. Leaders begin to feel the jobs they have accepted are different from their actual jobs. The “promises” made during the selection process are now in question and the behaviors that previously brought these new leaders success in the past are also being questioned by their organizations. This is when our onboarding process proves itself as an invaluable resource. It is critical that the organization provides resources for its new leaders to be successful. From our experience, we have found this success depends on a partnership that includes the hiring manager, the new leader and the human resources partner. It is also important for these new leaders to have role clarity, onboarding objectives, and understand the leadership culture. In addition, the “three-legged stool” model of partnership is vital for successful onboarding. When each of these partners is engaged and understand the unique role they each play, the chance for the new leader’s success greatly increases. We work with our client partners every step of the way to determine how to develop a blend of internal capacity and use of external expertise in order to sustain results that evolve with the business. Our onboarding program produces a dramatic and measurable impact on employee productivity, retention, employment brand, service/product quality, workplace safety, and future hiring success. We’re ready to prove everything we claim. Why not give us a call and find out more about us? You have so much to gain and absolutely nothing to lose. Give us a call today (855.316.8161). We think you’ll agree that when it comes to leadership onboarding, we’ve got you covered. Click here to view our onboarding information sheet.